An OCS reader wrote me following mail. Go through it and try to find out how would you explain him to solve his problem. "I have a question about calculating SAM for an operation or a garment. Basic time= Observed time * performance rating and use a higher performance rating the time taken for the operation is higher than if you took a lower performance rating that is lower. Is this to mean that a lower operator performance will yield faster completion of garment making tasks? that seems counter intuitive to me. Please explain"
For a while I also started thinking, how it is coming? A higher rated operator taking higher time than the low rated operator. I know it is not true. But where the problem lies in above example? I answered him with following explanation. Don't worry. Just go through following explanation. You will find what is wrong in the above example. You are going set standard time (SAM) of an operation through time study. First you need to calculate Basic Time. 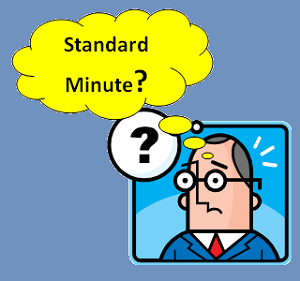 You need to level the observed time (cycle time) to get standard time. And leveling of time is done by multiplying Rating factor (performance rating). Example, You timed one operator and it is 10 minutes, you rate her 50%. As the operator's rating is less than 100%, she would take higher time than the standard time. And standard time would be lower than 10 minutes. Right? So you multiply rating with observed time to calculate basic time. And it is (10 * 50%) = 5 minutes. It means an operator who works at normal pace (no too fast or no too slow) should take 5 minute to complete this operation. For same operator, taking 10 minutes to compete that operation and you rate her 100%. Logically, it is not possible. Either you timed wrong or rate her incorrectly. In reverse way, a 100% operator and a half efficient (50%) operator can not complete a task in same time (10 minutes). Your assumption is wrong in the above example. Conclusion: A low performance operator would take higher time to complete the given operation than a higher performance operator. How would you explain the solution? Please add it into the comment box. Application of performance rating in SAM calculation using time study method.